In the wake of Category 5 hurricanes Irma and Harvey, Dr. Sebastian Lüning and Prof. Fritz Vahrenholt presented an analysis of what’s behind the hurricane activity and literature at their well known Die kalte Sonne climate website. Their hope is to bring the hurricane discussion back to some rationality. The German media of course have been covering the story quite intensely, and at times hysterically. The general tenor of most statements: Hurricanes are not directly caused by climate change, however their power and destructiveness is increasing due to global warming. The claim is that warmer oceans are providing the fuel to produce larger hurricanes. 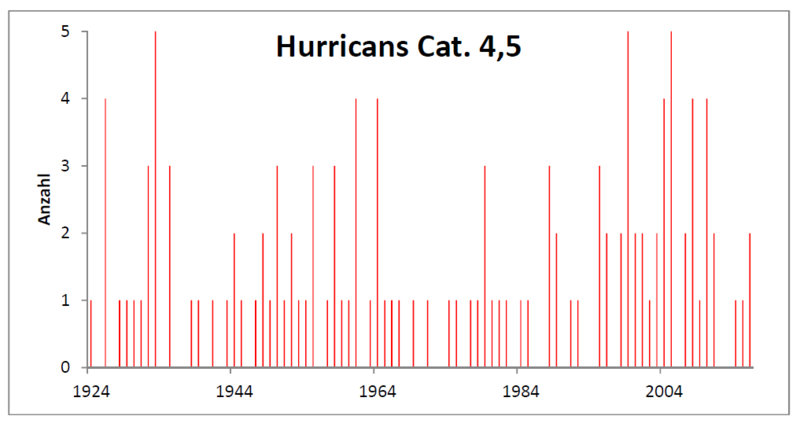 There were quite a number of hurricanes in the 1930s and 1950s, as well as in the 2000s, but the trend has been sharply downward since 2010, despite the warming, and so considerable doubt swirls surrounding all the claims heard in the media. Fig. 5: The dependency of the share of Cat.4-5 storms on modelled temperature rises (ACCI) in different oceans, green represents the Atlantic region, red is for the Indian Ocean, and blue for the Pacific. Source: Fig. 5b from Holland et.al (2014). Even using the data from the carefully selected 1975 to 2011 period does not produce any significant trend, Vahrenholt and Lüning note. Moreover the two German analysts say Holland relied on too few data points coming from the Indian ocean and falsely applied them to claim a “global” trend. Vahrenholt and Lüning cite a new paper to explain what impacts the energy of a hurricane. Mark A. Saunders of Great Britain and the USA diligently examined observations going back to 1878 and discovered a factor that describes the energy of a hurricane very well: the strength of the northern Passat winds. 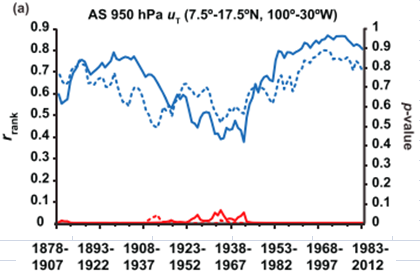 Fig 6: Correlation (r, blue) and its significance (p<0.1 is highly significant, red) on the hurricanes energy (ACE), -solid blue curve – and its number -dotted blue curve – with the Passat winds. Source: Fig. 3a from Saunders et.al (2017). 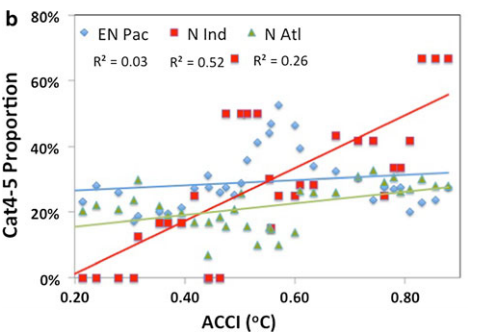 A second related factor improves the correlation further: The temperature difference between the Main Developing Region (MDR) located within 10° – 20°N and 85°W – 20°W and the global tropical area within 10°S to 10°N. 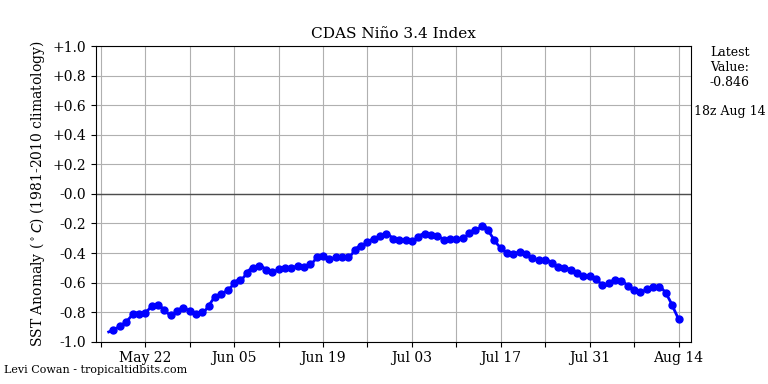 It is long known that hurricane development during times of El Nino is dampened and during La Nina it is enhanced, thus it has to do much more with natural oceanic variability. Figure 8 below depicts the difference in sea surface temperature (SST) between the main developing region (MDR) and the tropics using observations ERSSTv5, with 10-year smoothing applied. Fig. 8: The black line is not the horizontal axis, rather its is the linear trend! One observes the AMO similar pattern. Lüning and Vahrenholt also cite literature showing that the Passat winds will not increase with climate change, but rather indicate a decrease in hurricanes. Some media outlets have responsibly pointed out that the problems and destruction caused by hurricanes have much more to do with people living in hurricane vulnerable areas. The claim that rising sea levels (10 cm since 1960) caused by global warming is major factor in hurricane destruction is also a non-factor in view of the fact that hurricanes generate waves that are 6 meters high! 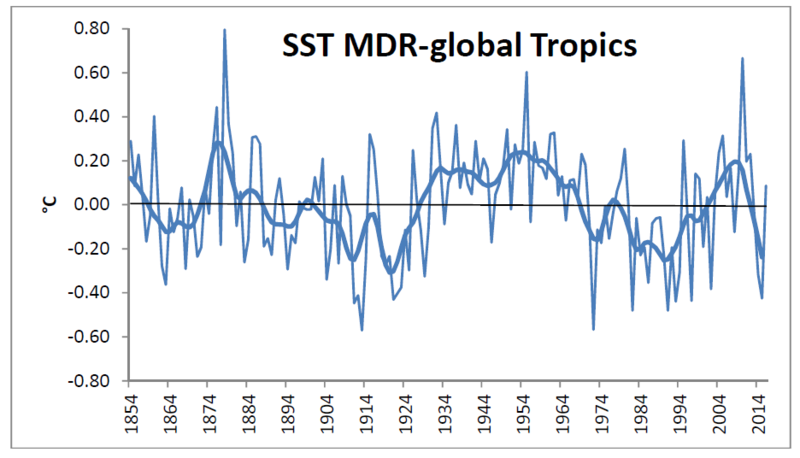 In summary, the real hurricane driver of hurricanes is the SST difference between the MDR region and the global tropics. The following graph tells us why current hurricane activity is so high. Fig. 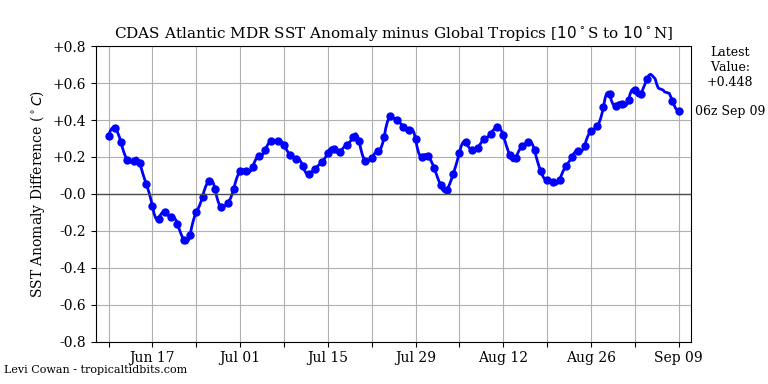 9: The current sea surface temperature difference between the MDR and the global tropical oceans, source: Tropical Tidbits. Do not forget that the El Niño indexes began to decline as solar activity increased (geomagnetic). Yep, the over all amount of death and destruction is not a scientific metric in any way shape or form, but it is the one the left is most often choosing to use because it suits their narrative. ie: “Super Storm Sandy”. BTW it is probable that Jose will remain off the US coast though it could impact the Canadian coast. The new TS Lee is expected to go NW well out into the Atlantic and meet it’s death in the colder water there. The storm to watch, is Tropical Depression #15. It could well develop into a major hurricane and impact the US coast. Florida dodged a bullet with Irma thanks to Cuba and a stronger than expected trough that ate at the west flank as the east flank was over Florida. RAH the surface of the Caribbean Sea still has a high temperature. Here we have the current surface temperature. The hurricane is near the Lesser Antilles. As the magnetic activity of the sun increases, the jet stream retracts to the north. Currently a geomagnetic storm is underway. No way you you can say it was caused by what the warmists want to blame it on. Maria hurricane hit the island of Dominica and Martinique in the Lesser Antilles archipelago.